A camera lens, like the one pictured above, actually consists of many lenses. The lens affects the quality of a still image by controlling the amount of light that reaches the image sensor. Other characteristics, of a camera, that affects the image quality are field of view, iris, f-number (or f-stop), focusing, mounts and lens quality. 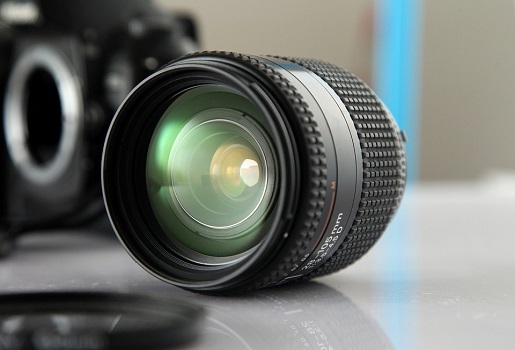 Knowledge of types and characteristics of camera lens is of great importance during forensic video analysis and forensic still image analysis. Using forensic video enhancement, different techniques can be applied on low quality images or videos to highlight important elements of the video evidence or still image evidence, which could not be captured due to many factors (such as inferior lens quality, mis-calibrated equipment, poor lighting conditions, etc.). In this post we will discuss the important characteristics of a camera lens that can affect the quality of still images or videos. Fixed lens: In fixed lens, focal length is fixed and only one field of view is available. In other words, a fixed lens is not capable of zooming in or out. Most surveillance cameras today have fixed lenses, which makes forensic video enhancement crucial for clarifying the facts and details of a case. Varifocal lens: A varifocal lens has different focal lengths and thus different fields of view are available (ie. it can zoom in and out, albeit typically minimally). However the field of view should be changed manually. Focal lengths in the range of 3 to 8 millimeters are available in varifocal lens for network or surveillance cameras. Zoom lens: A zoom lens also offers different field of views. However in a zoom lens, refocusing the lens is not required to create a change in the field of view in a specified range. If lens adjustments are required, it can be either done manually or motorized. Focal length is the distance between the entry lens and the image sensor, or the point where all light rays converge. Focal length and size of the image sensor together determine a camera’s field of view. If the focal length of a lens is short, the field of view will be wide. The typical size of image sensors are 1/4, 1/3, 1/2, and 2/3 inch. Telephoto lenses have a focal length of more than 70 mm and are used to capture objects that are very far off or smaller in size. It is good for long distances and has less geometrically distorted images. The disadvantage to this type of lens, however, is that they sense less light. If less light gets in the lens, the image may be not as bright or clear. Wide angle lenses have a focal length of less than 35 mm. They are used when a wide field of view is required. The advantages typically are good depth of field and better low light performance. The disadvantages of using a wide angle lens are increased geometrical distortion and bad long distance viewing. The Aperture diameter, or iris, determines the amount of light that passes to the image sensor. A bigger iris will result in more light passing on to the image sensor. Another factor that determines the amount of light reaching the image sensor is exposure time. Low light conditions will require a bigger iris and longer exposure time. Whereas a brighter environment requires a smaller iris and less exposure time. To capture quality images optimum light should pass to the image sensor. Getting the correct amount of light to the aperture is key for too much light will result in overexposure and too little light will result in dark images. Therefore shutters and adjusters are used to control the exposure time and iris respectively. Depth of field is the distance in front and beyond the point of focus, where objects simultaneously appear to be sharp. The Focal length, Iris diameter and distance from the camera to the object together determine the depth of field. Longer focal length will mean shorter depth of field and similarly wider Iris diameter will also result in shorter depth of field. Understanding the depth of field is often very important when evaluating surveillance video in order to determine the best forensic video enhancement techniques to use. Sunshine or lots of light: In such situations, use a small iris opening and shorter exposure time to achieve better quality images and higher depth of field. Overcast or cloudy sky: For obtaining better quality images of moving objects in overcast lighting conditions, reduce the exposure time. This will result in reducing the depth of field. On the other hand if you increase the exposure time, blurring of moving objects will increase. However if capturing moving objects is not the end goal, then increasing the exposure time will improve the depth of field and overall quality of the images. Evening and night: In low light situations, increase the light sensitivity of image sensors. However this will increase the noise in images. Different recording conditions, as mentioned above, will result in different types or qualities of video. A forensic video expert will take all of this into account while evaluating and analyzing a video to determine the best forensic video enhancement techniques to use on the evidence.